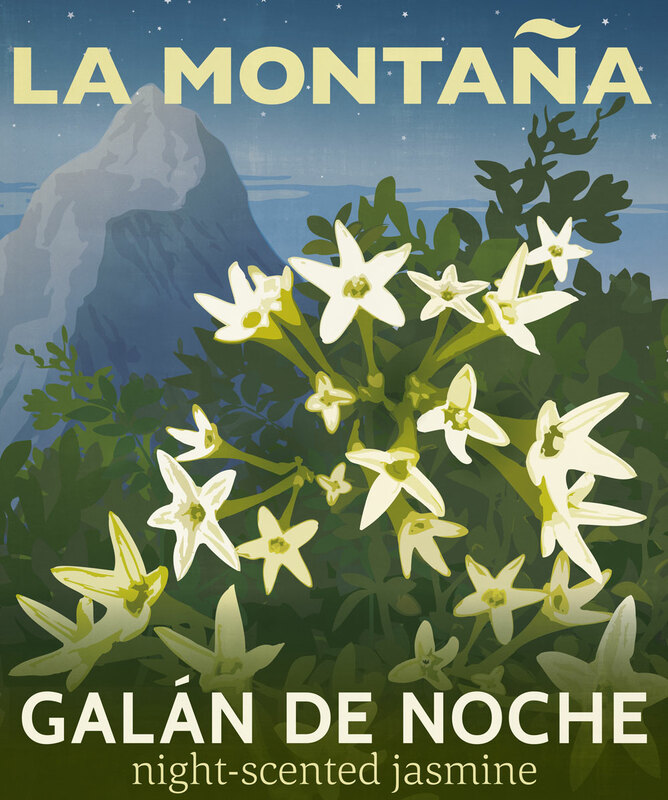 Cass and I actually met on holiday in Spain, way back when… And galán de noche (night-scented jasmine) is a memory for both of us – and for many other Brits, I suspect, from our very first non-family trips to Spain: night-scented jasmine is the warm, dreamy, unmistakable scent that filled entire streets as you make your way home at dawn after a long night out. Jasmine is one of those fragrances that’s so magnificent in nature, but that is so hard to capture (rather like wisteria, orange blossom, and gardenia). So when we came, we decided to plant LOTS of it; and different varieties, which would flower in different seasons, thus keeping our noses happy all year long and in every corner of our garden: there are star jasmines, and French jasmines, and common jasmines, as well as the strongest-scented of them all, the stunning galán de noche. Originally we assumed that night-scented jasmine was just a particularly strongly scented one that you noticed more at night. But no! It turns out that the flowers only open in the dark! You only get the faintest hint of the fragrance during the day, when the flowers are shut tight, but at night… it is glorious and intoxicating. In fact, when it flowers between the end of August and September we move a pot of it to right outside our open bedroom window. Now, we’re learning as we go along – and working with our brilliant perfumer, Marianne Martin – and it turns out that a candle with only galán de noche perfume oil in it would be far too overpowering; you have to surround it with other notes to complement and glorify it. Although the image on the label – one of our favourites by the way – is simple, and only shows the jasmine, the fragrances also has notes of rose, orange blossom, and ylang ylang. It’s from the ‘Bright Floral’ family of fragrance, that combines the traditional Single Floral and ‘Floral Bouquet’ categories. If you like a heady, intriguing, intoxicating, sensual candle, you will love it – maybe one for a romantic night in. We are also deeply taken by the fact that ‘galán’ is an old-fashioned Spanish word meaning ‘a gallant man’. Cass likes to picture him as an incredibly handsome young swain, who seems quiet and shy during the day, but when night falls, out he comes, a-swashing and a-buckling, leaving swooning girls in his wake. The jasmine is also sometimes known in Spain as ‘dama de noche’. So, depending on your fancy, it’s either a swoon-inducing swain, or a passionate, flamenco-dancing, lady of the night.